The fifth Passport to Nature program will launch soon! Stay tuned. We are very excited to share the 5th Passport to Nature program with you! The Passport program continues to be exceptionally popular and there is so much to learn and explore. Bring your own water bottle, hiking boots, hiking poles, snacks, sunscreen – whatever you need to enjoy your time outdoors! If you have any questions, any of the staff are happy to help. Call the office (705.326.1620) or email info@couchconservancy.ca. Thank you to the wonderful people who have dedicated countless hours to making the Passport to Nature a success: Adam Thomson, Ginny Moore, Jamie Ross, Janet Machan, Jan Walinck, Joan Berndt, Pamela Fulford, Stefanie Moy-Shuster, Sue Deadman, Tanya Clark and Tom Wilson. A special thank you to Judy-Mitchell Wilson as well. Links coming by the end of April! The early birder finds the bird! 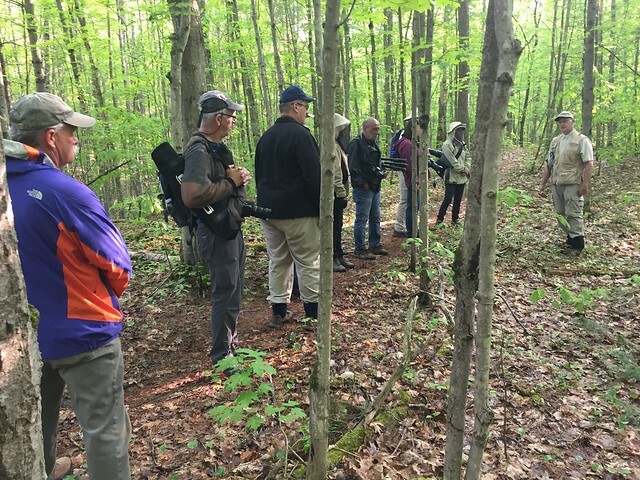 Join well-regarded and well-respected birder, Greg Sadowski and hike the trails of almost 200 acres of mixed upland forest, ponds, and wetlands adjacent to the Trent Severn Waterway. The diverse habitat is suitable for a wide variety of warblers and other spring migrants as well as songbirds that make the properties home. Trip consists of easy walking with frequent stops. Wear comfortable footwear, bring binoculars and a bird guide would be helpful. Biting insects and ticks are possible and participants should take appropriate precautions. Tour goes rain or shine. Join in for the 15th annual Carden Challenge in support of conservation efforts of the Carden Alvar, a globally rare landscape. Join or form a team of four people and head out on the Alvar in search of as many species as possible in 24 hours. Join three talented and enthusiastic photographers at Cameron Ranch to photograph alvar flowers in all of their glory. Dave Kennedy, Deb Halbot and Karen Fox will describe for you how they decide on what they want to photograph, and how they go about it. Dress for conditions and assemble at Cameron Ranch parking lot. Some walking is required, and don’t forget your camera! If you have ever wondered what it is like to volunteer as a citizen scientist, THIS is your chance to find out. The Deadman Easement is rich in species diversity, and last year we offered every citizen science program available on the property: Salamander, Reptile, and Water Quality Monitoring, Frog Calls, and our two-year Whip-poor-will survey program. At this event, you will have the opportunity to try out each of four activities, moving from station to station every 20 minutes. Equipment to bring if you have it: Rubber boots, binoculars, camera, water, sunscreen, bug spray, and lunch or a snack. At the end of the event, you will have the chance to sign on for the 2020 Field Monitoring Season. Join us at Grants Woods, the headquarters of The Couchiching Conservancy and learn all about birds you can expect to attract to your backyard or see in the woods near Orillia. Expert birder Janet Grand will give us tips on ideal birdfeeders, using bird guides and managing binoculars. We’ll spend some time in an accessible pavilion and take a short excursion on a fully accessible trail (wheelchairs and walker) with rest chairs. Binoculars and bird guides will be provided for those who need them . Biting insects very likely! Ideal with participants with limited mobility. Rope Making Demo, Blue Bird Display, Arts & Crafts, FREE Kawartha Dairy Ice Cream & more! Were you born between 1982 and 2002? Have a curiosity about nature and birds? Learn the basics of birding, identifying by sight or sound and more with one of your peers! We region is home to hundreds of species – it’s time we learn about them! We’ll take a hike through the woods, and hope to see and hear some interesting birds. Please bring binoculars and ID books if you have them. We will have some for people to borrow as well. What butterflies will we see and identify together on the Conservancy’s newest Nature Reserve? Join in with two knowledgeable leaders in search of Monarchs, Bronze Coppers and Baltimore Checkerspots and much more. No butterfly nets are required as we will be using cameras and binoculars. Binoculars will be provided if you need them and you might even learn some hints for photographing these beauties. We will be walking through long grass where ticks and poison ivy live so come prepared. The Black River Road is fairly remote so be sure to gas up the car before heading out. Nestled within Queen Elizabeth II Wildlands Provincial Park, the Conservancy’s newest reserve – the Ron Reid Nature Reserve – is at the heart of one of southern Canada’s most powerful biological engines. QEII & RRNR create an important corridor of connected wilderness. Together we will explore a portion of the area. Please be prepared for the day with good footwear, snacks/lunch, water, hiking poles and other personal items.Thank you to our sponsors! Southern Ontario has hundreds of moth species, ranging from tiny and plain to colourful and spectacular. Join us at a cabin nestled beside the boundary of Carden Alvar Provincial Park, where a brightly lit sheet will draw in local moths for a close look. Candice will explain the basics of how to identify moths, their life history and biology, and tips on field guides and information sources. Bring your camera if you wish. Event may be postponed if there is rain or high winds. Copeland Forest has an amazing array of woodland ferns, totaling over twenty species. Come along on a leisurely walk with Pat Woodford who has taught herself how to identify the various Ontario species using a variety of easy to remember traits. Bring your camera to produce a photo record of the day’s discoveries. Dress for weather, you might need bug repellent, and comfortable walking shoes. Take a pleasant walk in the woods with your guide and learn tips to identify trees in winter by bark, twigs or buds. Wear sturdy footwear and dress for the weather. Come for a walk on the Wilkins property which has an easement agreement between the Couchiching Conservancy and the owners. Learn about how an easement works, and after a pleasant walk in the woods, enjoy an art activity with local visual artist Mary Ann Tully. Join our friendly leader as she helps explain what to do, and not do when hiking in Ontario. Bring your family for a hike that will help you gain confidence when you explore nature in Canada. Learn to read a trail blaze, what poison ivy looks like and how to fend off dreaded mosquitoes! We will also discuss appropriate clothing for different seasons. We ask that you come ready to learn and with your questions about local plants and wildlife. We will speak and hike slowly so that all can learn, and have a great day together! Join us on a guided walk that will introduce participants to the mushrooms and other fungi in a woodland habitat. The focus will be on highlighting the basic differences among the Families of fungi, and to demonstrate the roles and functions of fungi in the woodlands habitat. Please note that this is not an “edible wild mushroom” presentation. Come dressed for the weather. Bring your cameras! Registration is required and is open now! The Carden Alvar is a shimmering mosaic of globally rare wildlife habitats situated between southern and central rural Ontario. Often going unnoticed, the rich biodiversity found in the area is in critical need of conservation for long term. You’re invited to attend an evening of science communication, where you’ll have the opportunity to virtually visit the wondrous woodlands, alvars and wetlands of Carden. Accompanied by photographs and video, this journey is sure to fuel your appreciation for wild creatures that call Carden home. This event is in partnership with the Carden Field Naturalists Club. Calling all curious kiddos! In partnership with the Orillia Public Library, join in for story time and activities at Grant’s Woods. Weather permitting outdoor activities included so please dress appropriately. Best for ages 6 and under but families welcome! Local members of the Ganaraska Club will guide you along the trails of the Copeland Forest. Located on the edge of the Oro Moraine it contains the best example of mature upland forest in the region. Bring your own snowshoes or test out a pair courtesy of Sojourn Outdoors. Children accompanied by an adult are welcome. Join us for a snowshoe tramp through the trails of the East Coulson Swamp property. The terrain is level and our pace is slow, because Brittany Hope, our leader from the Nature Conservancy of Canada can’t go down a trail without finding something of interest to share with us. You must provide your own snowshoes and come dressed for the weather. Families with children are welcome! Sign up for our e-newsletter to make sure that you are notified of events like this and other conservation news. We send an e-newsletter roughly once a month. These wonderful sponsors make the Passport to Nature possible. Because of their support, there is no cost to attend any of the events. Please consider using your spending dollars at these businesses and organizations. Passports to Nature in Canada is your invitation to experience the marvels of our natural world in communities across Canada. Each passport describes guided events that are open to all and often free. Where in nature will you travel this year? A special thank you to The Gosling Foundation for inspiring environmental organizations and supporting engagement. This entry was posted on March 28, 2019 at 8:55 pm, filed under Featured, Uncategorized and tagged events, Passport to Nature. Bookmark the permalink.